No, we really mean that - it's the Nürburgring. That wonderful racetrack that's inspired and terrified many an F1 driver at the same time. Yes, we know that it isn't the same as the old Nordschliefe track, but there's no denying that the modern day GP Strecke is still challenging enough to throw many a racer off balance. The first part of the track is tight and twisty, while the second half of the track has flowing corners. Getting the car setup to perform well across this particular track is a challenge for teams and drivers alike. Besides, the Nürburgring is still set amidst the dark, mysterious Eifel Mountains that gives us the goosebumps. Sebastian Vettel's first full season of Formula 1 was in 2008. And every year since 2008, a German Grand Prix has been held. And every year since 2008, Seb Vettel has gone, seen and failed to conquer. 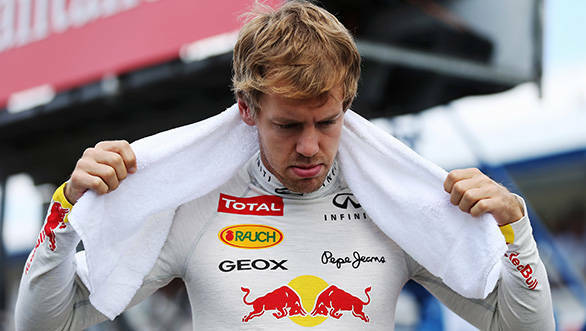 What is it about the German GP then, that Seb can't come to terms with? Is it the pressure of racing in front of his home crowd? Well, Vettel doesn't seem to think so. In fact during the Thursday's press conference Vettel told a roomful of journalists that he thought their work over the last four years was of more importance than the fact that he hasn't managed to win in Germany. Is there a chance that he'll break it this year? Not if the rest of the grid has anything to do with it. Nico Rosberg has taken two wins of the first eight races in the 2013 season. Lewis Hamilton hasn't managed a win yet, but he's still standing fourth in the drivers championship at this point. And when it comes to Rosberg and Hamilton's performances in the season so far, it certainly isn't a case of a pair of drivers dragging an unworthy steed to the front of the grid. The reason Rosberg and Hamilton have been doing well in 2013 is that the W04 is a quick car, capable of taking the challenge to Red Bull Racing. Just look at qualifying last race. In fact, take a look at Free Practice 1 that's just gotten over in Germany. 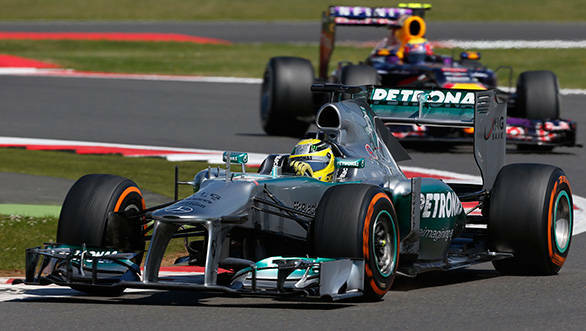 The Mercedes' of Hamilton and Rosberg were the only two to break into the 1min 31secs times. It's no wonder that they've managed to pip Ferrari to second in the championship. 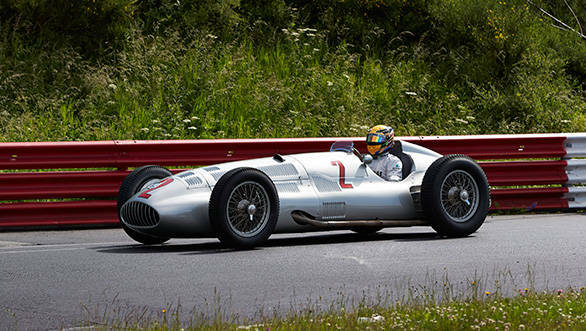 Things are looking good for the Silver Arrows. It's not very often that you see Force India managing to take the challenge to a team as well-established as McLaren, is it? Well, the team in tricolour overalls have been steadily on the rise in 2013, although they've managed to muck things up and throw away their advantage on occasion. Case in point: the British GP, where Paul di Resta was relegated to the back of the grid after a stellar fifth place in qualifying, because his car was found to be 15kg underweight. That aside, of the first eight races of the 2013 season, di Resta has finished seven, and managed to score points in all. Sutil has had four points-scoring finishes. This means the team now has moved to fifth in the championship, with 59 points. Jensen and his engineer look tense here, don't they? 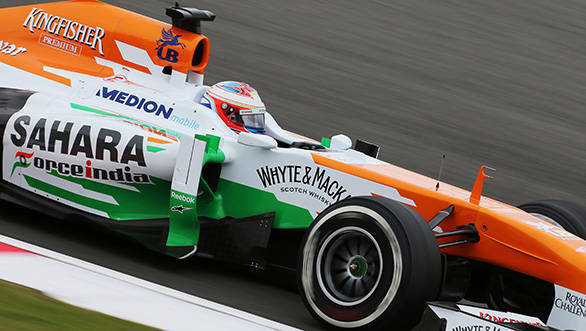 The team that Force India has just pipped in the world championship standings is one with Grand Prix pedigree aplenty. McLaren now find themselves, with a meagre 39 points haul, in a somewhat uncomfortable sixth position. 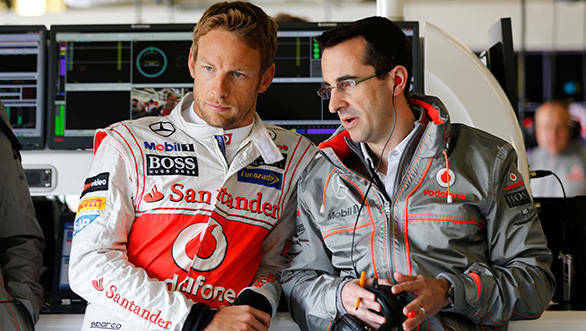 Button probably finds himself wishing it was him in Hamilton's racing shoes. And Perez, well, he might just have done better at Sauber. Michael Schumacher, until very recently, held the record for most number of consecutive points scoring finishes. That's a record that Kimi Raikkonen has gone and broken at the British GP. You see, Schuey had managed 24, and the Iceman's gone one better with 25. There's a chance that he'll break his own record this weekend and make it 26. The black and gold will be ecstatic. And Kimi? Well, Kimi might just break into the merest hint of a smile. He's been acting tremendously shifty of late. Yes, ever since he got a new haircut, Kimi's been ensuring he doesn't take his cap off at all at any point! So we've seen him with a cap on, with his balaclava on, and then with a helmet on. What we haven't caught sight of is that haircut. Raikkonen has now stated, in his stoic way, that he'll reveal to the world his new haircut provided he wins the German GP. What we're afraid of is that it'll look no different from his usual haircuts. But it's good ol' Kimi. Hopefully he'll have something that will keep us amused and entertained. Hats off to Paul Hembery for not going into hiding. Honestly, we know that the exploding tyre saga that played out at the British GP wasn't Hembery's fault, but given that he's Pirelli's face at the F1 races, he's the one facing all the heat. Well, Pirelli's official statement declared that their tyres were perfectly safe, provided they were used the right way (without the left and right tyres being swapped around). In any case, the Italian tyre manufacturer has introduced a type of tyre that will be used through the remainder of the 2013 season. This tyre will now come with a kevlar belt instead of a steel belt to ensure that the strain felt on the rear tyres isn't quite as much. 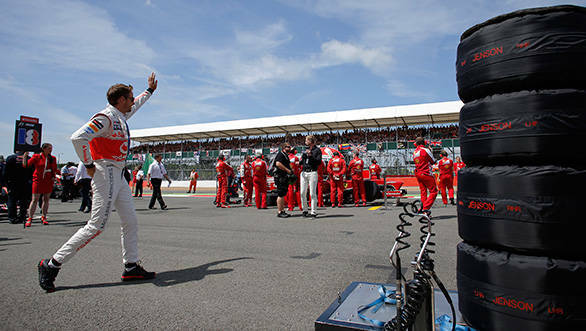 Given what happened at last weekend's British GP, the drivers are threatening to withdraw from the race, should such incidents occur again. They've declared that they are ready to race on the limit all through, provided the conditions are safe. However, if conditions aren't safe, they'll pull out at once, since it isn't worth endangering their lives along with those of the marshals and fans. It's not the first time that drivers are threatening to pull out of the German GP, though. Back in 1976, Niki Lauda tried to organise a boycott of the race because he wasn't too thrilled with the safety conditions at the track. The other drivers weren't too keen on not racing, and so out on track they went. It wasn't too long before Lauda suffered his near-fatal crash at the Bergwerk corner. We're hoping nothing similar happens this year. 10. What if they do withdraw? Well, that won't be too much fun for the fans now, will it? They'll probably get really mad, what with having traveled all the way to the Nürburgring for a race that didn't happen. And while us fans at home have some options - we can spend our time breaking our televisions sets - the fans at the 'Ring might get bored. We recommend they hop on over to The Tiergarten Hotel, owned by the Queen of the Ring  Sabine Schmitz. Other than the fact that it has F1 memorabilia crammed into every nook and cranny, we're told the beer is cold and the steak medium rare.